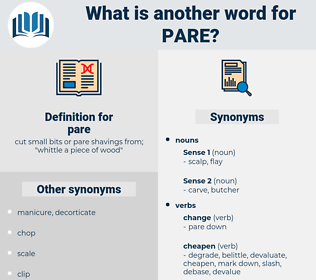 What is another word for pare? 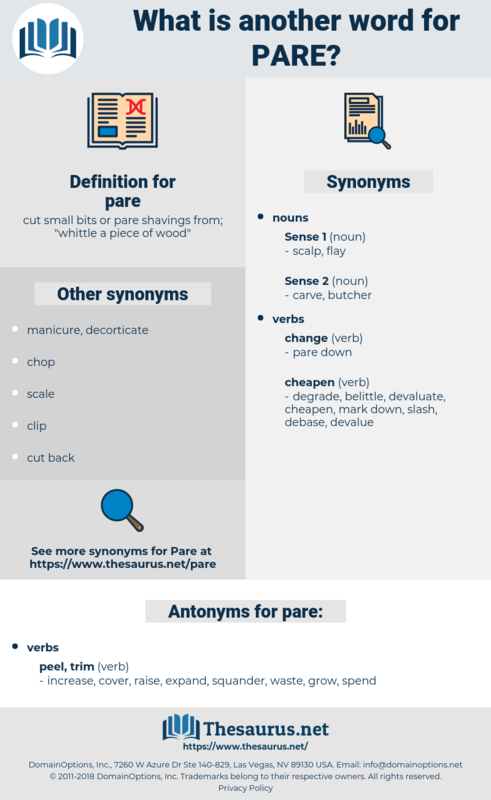 cut small bits or pare shavings from; " whittle a piece of wood"
increase, cover, raise, expand, squander, waste, grow, spend. Coolly as he might pare his nails, he broke off the slender shaft, pulled out the head where it emerged from his skin, and held out his arm and handkerchief to Gordon, who expertly bound up the profusely bleeding but harmless flesh wound. After three years' active service as army - surgeon, Pare returned to Paris with such a reputation that he was at once appointed surgeon in ordinary to the King.